Is That Old Presidential Campaign Button Worth Anything? Even the most apathetic among the American populace usually stops to ponder who they'd like to see, or not see, as our country's next president at some point during a campaign. It's an American tradition, and now so more than ever. For some folks, however, the presidential campaign buttons accompanying an election provide more entertainment than a fleeting bid for the White House ever could. Think about all the promotional campaign items you saw when watching the Democratic and Republican conventions on television or reading about them in your favorite newspapers and magazines during the last election. Remember the hats, banners, posters and, most of all, campaign buttons? This is the type of memorabilia presidential campaign collectors relish finding in wonderful condition, especially those buttons from way back. Even folks who don't collect pin-back buttons can appreciate the historic struggle represented by a bright display featuring the faces and slogans of those vying for the prestige and power of the presidency. Just about any presidential button, old or new, holds some value now. It may only be a dollar or two for newer editions, but the collector holding the button couldn't be more pleased to have it as part of their ever-expanding collection. Although campaign buttons were generally produced in mass quantities, many examples made their way to the trash heap when the presidential contest concluded. Of course, mass quantities in the early to mid-1800s when they were first used to convey partisan loyalty compare differently to the millions of buttons produced expressly for collectors today. In fact, you may remember televised news features denoting which buttons were hot with convention goers during presidential elections over the past decade or two. Specializing in older buttons presents more of a challenge for collectors since there are fewer on the market, but prices don't always rise in relation to the age of the buttons. Some of the most popular buttons have sentimental value attached to them, with those produced for the Kennedy campaign being prime examples. "A Kennedy-Humphrey button can be worth $300-$500. This outranks even Lincoln, Roosevelt, and Huey Long memorabilia," said collectibles writer Joyce Worley in an article previously shared online. Most of the buttons made during the last 50 or so years aren't nearly that valuable, including the more common Kennedy buttons. Many 20th century examples can be found for under $20 and even the harder to locate contemporary examples won't sell for more than $100 in most markets. So who collects these political representations of American culture? Actually, it's most often ordinary, everyday people who have a passion for history and a desire to preserve authentic pieces of the American political past. And you can note the word "authentic" is used here for a reason. 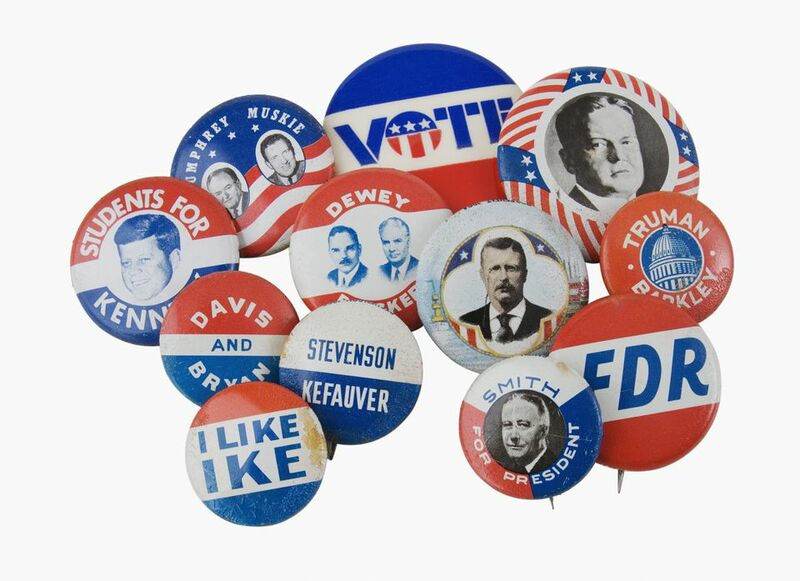 As some campaign buttons and political items increased in popularity and prices begin to rise, reproductions also become an issue. Seasoned collectors get a feel for what's genuine through learning and comparison, as with most areas of collecting. Novice collectors interested in campaign buttons usually start small and work their way up, less affected by reproductions if they concentrate on more common, inexpensive items. Rarities pose more problems in this area, so if you start seeing a button that should be hard to find over and over again, that will serve as your red flag to steer clear. Although most campaign buttons have one dimension, some of the most popular with collectors are "flasher" buttons, which generally sell for higher prices. These interesting items show one view at a certain angle and another when viewed from a slightly different point of view. "A button from the 1964 campaign is a bit presumptuous in portraying Lyndon Johnson and the First Lady moving out of the White House from one angle, while from the other, Barry Goldwater and wife are moving in," notes collectibles writer Victor M. Gonzalez in an online feature. Although most campaign buttons aren't quite that entertaining, they all grab and hold the collector's interest through the clever slogans and remarkable characters they portray. From "I Like Ike" to "LBJ All the Way," each button serves to remind us of a unique period in our country's history.